If X-Wing was the new hope Death Star attack, then Star Wars Armada is the major offence on the Death Star from Return of the Jedi. It takes the scale up to frigates and capital ships but never forgets the ease that made X-Wing so fast and deadly. By getting a couple of simple rules absolutely spot on Armada is a game that rewards careful planning and cunning anticipation of your opponent. Large ships fire at the beginning of their activation, it’s a rule that feels counter intuitive at first; almost every miniature based game in existence runs on the concept of move then shoot but by switching the action to shoot then move you change the emphasis and pace of the game. You’re now setting up your actions for the following turn, making sure your ships are in the right position to take full advantage of where the opposition will end up. This theme of planning ahead runs through every aspect of the large ships and the special actions, or commands as they are called, are where this is really shines through. Every ship can make one of four special actions; change speed, concentrate fire, repair or activate squadrons. However these commands must be pre-selected, and in the case of larger ships must be selected several turns in advance. Need to change speed and increase manoeuvrability of that Star Destroyer because he’s galloping out of range? Well I hope you thought about that two turns ago. You can select to save these commands as command tokens that can be used at your convenience, but their effect will be much less than if you had timed the commands perfectly. Smaller ships require less of this command queuing so can react faster. It all adds up to make Armada a very strategic game, you have to plan ahead and acting on instinct won’t get you far. However there are some fast elements to the game and that’s where squadrons come in. It’s not Star Wars without lots single man X-Wings and swarms of TIE Fighters and the way Armada handles these is ingenious. Each squadron is a single stand of three fighters (becoming single ships for multiple crewed ships like the Millennium Falcon and Slave I). These activate in their own phase after the main ships. Smaller ships do not need to pre-plan their moves so are more reactive and can zip across the table however you please. The real clever aspect is that of engagement, if a squadron of fighters is within attack range of an enemy squadron then they are engaged, they cannot move and must attack the enemy they are engaged with. This simple rule opens up a swathe of tactical options; X-Wings are bombers so can do some serious damage to a Star Destroyer but not if they’re engaged with a swarm of TIE Fighters. If X-Wing was a skirmish game without the faff then Armada is a full blown miniatures battle game with a severely reduced amount of faff. If you like the concept of playing with miniatures but don’t like the thought of painting or making scenery then Armada is going to be right up your street. If you’re not put off by that kind of thing then there is still plenty of strategy, depth, planning and manoeuvring to satisfy a battle hardened war gamer, it’s just coated in a layer of lacquer and sheen not usually devoted to this kind of game. And make no mistake this is a miniatures war game, it is not a board game. Although the popular Star Wars theme, Fantasy Flight Games’ dominant market position and the utra-slick rules mean it will have a large cross genre appeal, this has all the trappings of a miniatures game; list building, deep tactics and strategy and a long play time. Game time is one of my only gripes with the game. Each game is played over 6 turns, and often this feels too short, especially as the first two turns are spent getting your weapons into range. I can see why this has been done, both thematically and gameplay wise. By having a limited amount of turns it focuses the game play and forces players to engage. I can also see how admirals would hyperspace out of combat when it’s obvious they’re not going to win, these are massive capital ships and having them destroyed would be a greater loss to your faction. However it often feels anticlimactic and the game ends just as its getting going. It’s about time to bring out the issue of value for money. If you are already a miniature war gamer then you are not even going to raise an eyebrow at the cost of an £80 starter set, it’s the going rate. But as a board gamer, especially one that has walked the bridge over to this side of the hobby from the amazingly well priced X-Wing starter set, then you’re going to have to take a long hard think about that price tag. Personally I believe there is £80 worth of game in the box but not £80 worth of physical heft. The game itself is stellar (interstellar you could even say) but in terms of actual components it’s my belief that the box is a little empty considering its price. 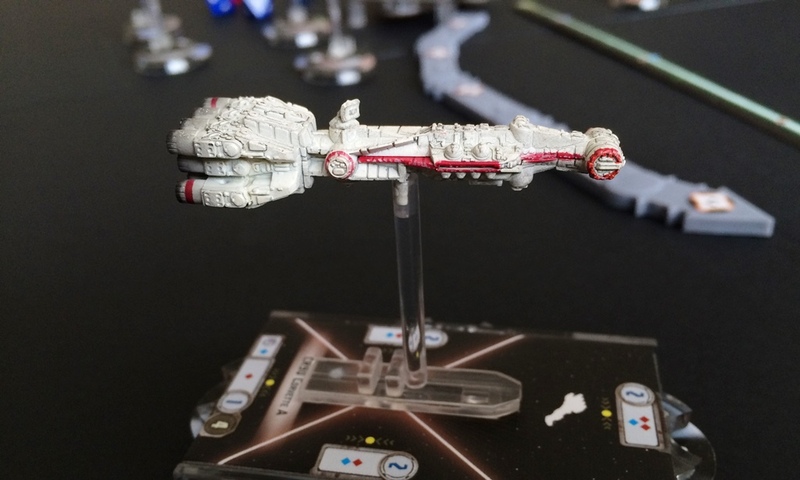 This issue is compounded, with the fact that you really need two starter boxes, or an investment in plenty of extra ships before you can consider launching the 300 point fleet that is going to represent a standard tournament game. I must also point out that I’m a little disappointed with the quality of the ships. 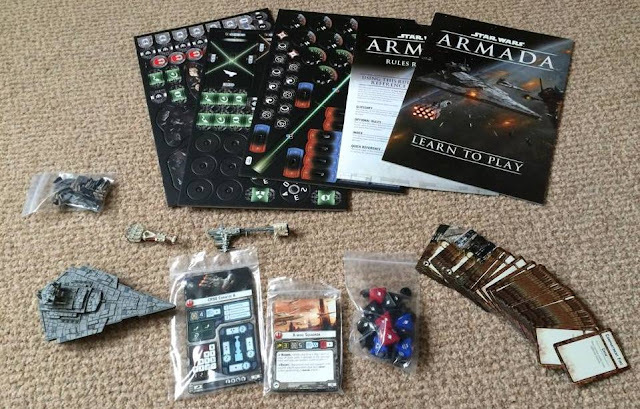 I bought my copy of Armada the very weekend it launched in the UK so my copy may have some early production issues but I can’t get past that some of my ships don’t sit straight on their stands and the paint job on the CR90 Corvette is a bit sloppy. I know not everyone has had this issue so I may have just been unlucky. It’s also worth noting that the squadron models are unpainted. This in itself doesn’t detract from their visual appeal and you can still paint them if you’re that way inclined. The bigger problem is that the models are very light which means they have the tendency to move at the slightest nudge. The rules for squadrons mean this isn’t going to be a massive deal for most people but I can see if you plan to use them in a tournament then the odd argument is going to occur. I’ve tried to base this review off of the core set alone, but it is worth mentioning what the extra ships adds to list building, namely admirals. Each fleet must be commanded by an Admiral, in the core box you only get one for each side, Grand Moff Tarkin for the Imperials and General Dodonna for the Rebels, but each new ship comes with a new Admiral to customise your fleet. Admirals are a hefty chunk of your points but add a special ability that acts across your entire fleet. Tarkin’s is particularly meaty, allowing you to add extra command tokens to your ships. 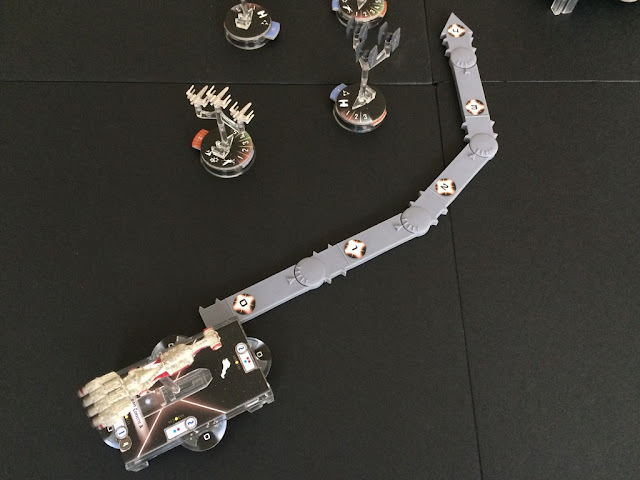 There’s a lot to Star Wars Armada and I feel that I’ve barely scratched the surface, both in my own playing of the game and in this review. I’ve barely mentioned the intuitive dice based attack mechanics, the streamlined critical hit system or the simple card based approach to list building, all of which will be familiar to players of X-Wing. There’s a lot of depth here and I hope to revisit this review in the future. 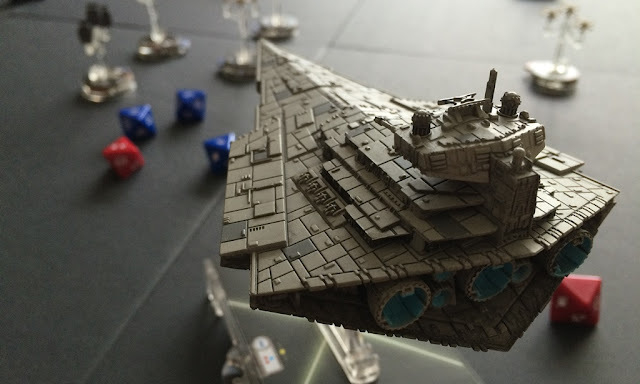 I said at the beginning of the year that this is going to be a game to look out for and there’s no doubting that Star Wars Armada is a brilliant game and one that’s going to take up a lot of my imagination and money over the coming months. We’ve already seen the release of the first wave of ships for the game and a leak on the second wave, already showing that Fantasy Flight Games is looking far ahead to support this game. 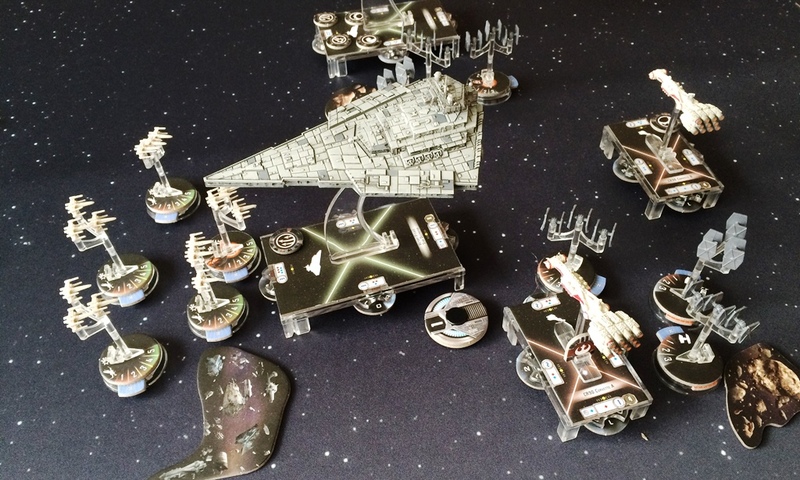 They have succeeded in making a game that is as streamlined and as flexible as X-Wing but also captures the strategic heft and ponderous manoeuvres of a naval battle while also seasoning the game with the rich flavour of the Star Wars universe.